It would be trite, in a Jon Stewart “should-I-play-the-montage?” kind of way, to go through all the different ways this is crazy and galling and ridiculous, given that president Chávez has hardly been seen in public in the last few years not wearing some version of the National Symbols – at least one of which he actually changed at the behest of his then-six-year-old daughter. But that would miss the point. Because the sheer, unembarrassed, plainly visible bold-faced double standard at play in all this, that’s the point here. 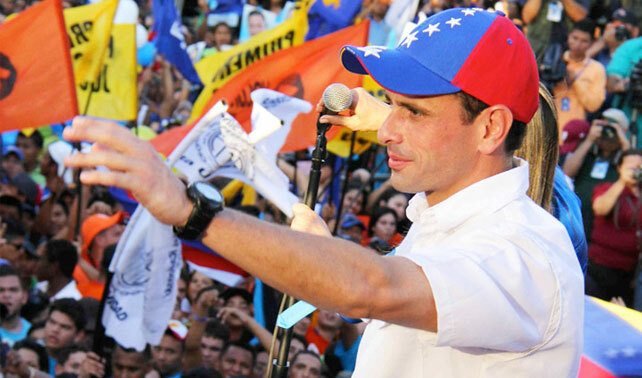 Capriles’s choice of headgear wouldn’t be worth Socorro Hernández’s time if ordering him to change it didn’t make it immediately obvious to everyone how unevenly the rules are applied. It’s only by being plainly abusive that the move succeeds in showcasing CNE’s unchallengeable power. Cabrujas once wrote that “el concepto de Estado es simplemente un ‘truco legal’ que justifica formalmente apetencias, arbitrariedades y demás formas del ‘me da la gana’. Estado es lo que yo, como caudillo, como simple hombre de poder, determino que sea Estado. Ley es lo que yo determino que es Ley.” But in Gorragate what we see is a state that’s lost interest in preserving even minimally believable fictions, one that treats the institutions of state as an instrument to rub our noses in its power rather than dressing it up in legal form. So no, we don’t defuse this kind of abuse of power by pointing out just how arbitrary it is, or how ironic, or how logic-bendingly silly. No number of pictures of Chávez wearing that tri-color jacket undermine it, because picking on Capriles for doing something Chávez has been doing routinely for years is what you do when you want to highlight your own unaccountability, not when you want to hide it. So just remember: as far as Tibi & Co. are concerned the aggressive irony here is a feature, not a bug.